Steel provided 4 no of 20mm diameter bars. 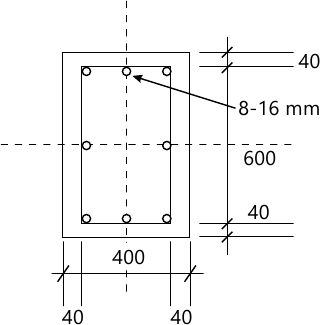 3 (b) A rectangle beam 230mm × 450mm (effective depth) is reinforced with 6 bars of 16 mm diameter out of which two bars are bent at 45°. Determine the shear resistance of bent up bars and additional shear reinforcement required if the shear force is 200 kN. Design shear reinforcement adopt M20 and Fe415. 4 (a) A column is 400mm× 600mm is reinforced with 8 bars of 16 mm diameter it is subjected to compressive force of 450 kN. Mx=50 kNm My=40 kNm check the safety of the column as uncracked section. Use M20 grade of concrete and Fe 415 grade of steel. 4 (b) Design a simply supported slab having dimension 4m × 6m. Assume live load of 4kN/m2 and floor finish of 1 kN/m2. Use M20 grade of concrete and Fe415 grade of steel. ii) the beam is post-tensioned use the following data. Es-200 kN/mm2 and Ec=35kN/mm2 Relaxation of steel stress=5% of the initial stress.